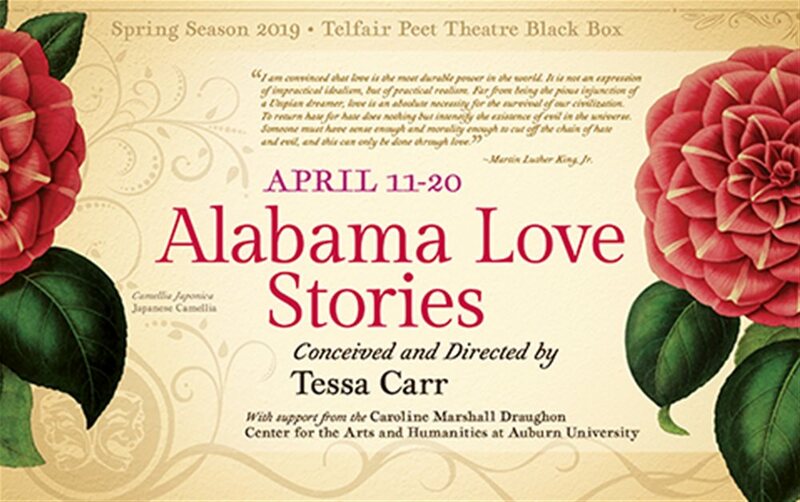 Auburn University Theatre Department will present Alabama Love Stories April 11-20, 2019, at select times at the Telfair Peet Black Box Theatre with support from the Caroline Marshall Draughon Center for the Arts and Humanities at Auburn University. Alabama Love Stories, a collaged original work, draws its inspiration primarily from archival materials found at the Alabama Department of Archives and History. With assistance from archivists and historians, the creative team has amassed stories that range across the 200 years of the history of the state of Alabama and that speaks to a multitude of loves: familial, romantic, platonic, love of ideals, and love of the land. Join us for a memorable performance of songs, images, poetry, non-fiction, and other artifacts as we share our stories. This production will take place in the Telfair Peet Black Box Theatre with general admission seating. Doors will open a half an hour before performance time. More information about Alabama Love Stories can be found here.